Why Would a Kitten Drink Out of Its Paw? We think it's cute; he thinks it serves a purpose. 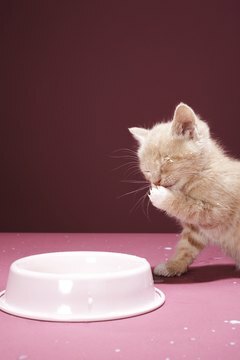 One of the cute things you might catch your kitten doing is dipping his paw in his water bowl and licking the water off. But you also might wonder why he's doing it. This is an instinctive behavior with a few different causes. Your adorable, fluffy baby is a descendant of wild ancestors at some point in his lineage, whether directly or distantly. They had to take steps, no matter how minute, to ensure their safety and, therefore, their survival. Part of this was checking to make sure water was safe to drink, so they tested it by dipping a paw in and licking it off before drinking it. It was also a means of making sure no other creatures were in it. This survival mechanism became an instinct. Kittens of feral parents are especially likely to do this. Another reason your kitten might drink water by dipping his paw into the bowl might involve his whiskers. Those whiskers contain nerve endings, making them very sensitive. If his water bowl is too small and deep, his whiskers may touch the sides when he drinks -- which could be a major irritation. Try giving him a larger, more shallow bowl or a cat fountain. Paw-dipping can also be a means of checking the level of water in a cat's bowl. Although your kitten is just a baby, there is still a possibility he might have a vision problem. Have his vision checked by your veterinarian if the behavior continues. Paw-dipping can even be an expression of insecurity or nervousness. Cats are creatures of habit, and any change to their environment or routine can be a major upset to them. Drinking water by dipping his paw into it allows your kitten to see everyone and everything around him, and to make a quick escape if he feels the need. Changes that could upset him include moving, redecorating, a change in his schedule or yours, or the addition of a dog or another cat. Even moving his water bowl to a different spot can cause this reaction. If you have more than one furbaby, give them each their own food and water bowls, and place additional bowls of fresh water throughout your home. What Does It Mean When a Kitten Arches Its Back & Shakes Its Tail? Why Do Cats Paw on Windows? Can You Give a Siberian Husky a Haircut?